Complete one max set of pull-ups. Keep fighting for a repetition until you fall off the bar. 1. Use the same load for each set. Set #1 (21 Rep’s) should be a 21 RM set. 2. Rest 30 seconds between sets. 3. Focus on keeping the stomach “sucked in” throughout the movement. 4. Be brave, and go as heavy as the rep scheme will allow. 5. Loads over 115lb. for men and 85lb. for women may use a rack. 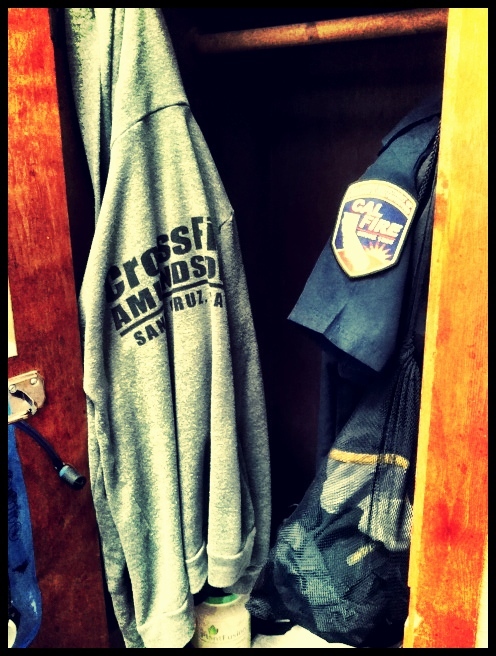 Jody Geare is on the job – Firefighter, Coach and Super Athlete. Come back soon! Attention Athletes! Tomorrow (Thursday, September 6, 2012) all training will be conducted at the Harbor Beach near the Crows Nest in Santa Cruz. Recommended parking is inside the Crows Nest parking lot or along East Cliff Drive. Class times are the same as normal. Following our evening workout, we will be having “Taco Thursday” with food and adult beverage provided by Cafe El Palomar from 7:30 PM until 9:00 PM. Bring your family and friends! Congratulations to Sean and Nathan on being the first CrossFit Amundson Athlete’s to run the Ocean Loop in the three minute timeframe. Nathan ran a 3:55 and Sean a 3:56, and that was after setting records in the deadlift. Great job guys! I hope you are ok…I was actually thinking about our conversation in the gym about the busy season ahead. I have been trying to follow everything and the status of the fire(s). I heard positive news TODAY, containment is up (15%). I have no idea if that is were you are or accurate, but I hope you are safe and healthy. Thank you for your service! See you soon! Thanks Eli ! I’m doing good just working a bunch! Hope to see you guys soon!